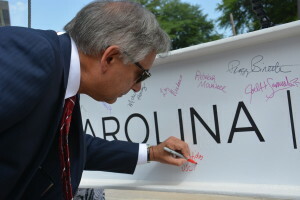 On Thursday, July 9, a little more than nine months after first breaking ground, the University of South Carolina School of Law celebrated a major milestone in the construction of its new home: the topping-off ceremony. 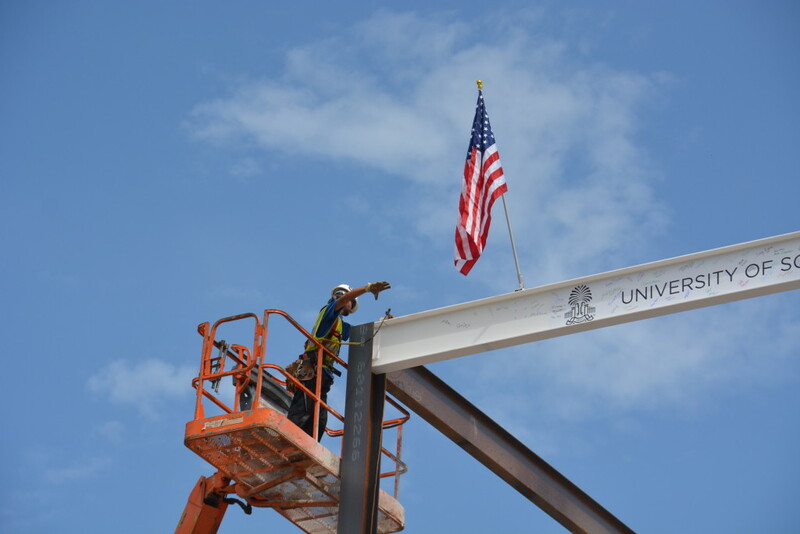 Faculty, staff, university trustees and distinguished alumni gathered to watch as the final piece of steel forming the structural framework of the building was lifted into place by construction crews. 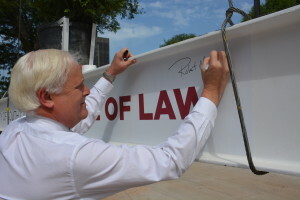 School of Law Dean Robert Wilcox said seeing the completion of this phase of construction is a reminder of how the school promises to further transform law education at the university. Over the next 18 months, the building will begin to come to life as its offices, classrooms, courtrooms, bookstore, library, café, commons area and courtyard take shape. Completion is expected by the School of Law’s 150th anniversary in the fall of 2017. In keeping with a centuries-old Scandinavian tradition, when the highest beam of a building is hoisted into place, a tree is raised along with it to symbolize the bringing of life to the new structure. The Leyland cypress raised at the School of Law’s ceremony will be removed from the beam and planted on the grounds of the new building. Because the cypress is a symbol of durability and longevity, it will serve as a living reminder of the School of Law’s long tradition of contributions to the state, the nation and the world. This entry was posted in One Minute Brief, Summer 2015 on 10 July 2015 by thefineprint.